In this area of the Apparel Search fashion brand directory, you will find women's fashion brands from leading apparel companies and fashion designers. On this particular page, you will find information regarding women's clothing with the Anna Sui brand. You are welcome to utilize this section of our clothing guide to review Anna Sui news, Anna Sui blog posts, Anna Sui photos, and more. Please understand that you may run into a few photos or a tad of information that does not actually pertain to the women's Anna Sui fashion brand. Unfortunately, no search technology is absolutely perfect We will continue to do our best to bring you as much information about the women's Anna Sui fashion collection as possible. Anna Sui is an American fashion designer from Detroit. Anna Sui's collections take you on a creative journey that is unparalleled in the world of fashion. Mixing vintage styles with her current cultural obsessions, she effortlessly makes hip and exuberant original clothes. Whether Anna's inspiration is Victorian cowboys, Warhol superstars or Finnish textile prints, her depth of cultural knowledge is always apparent. 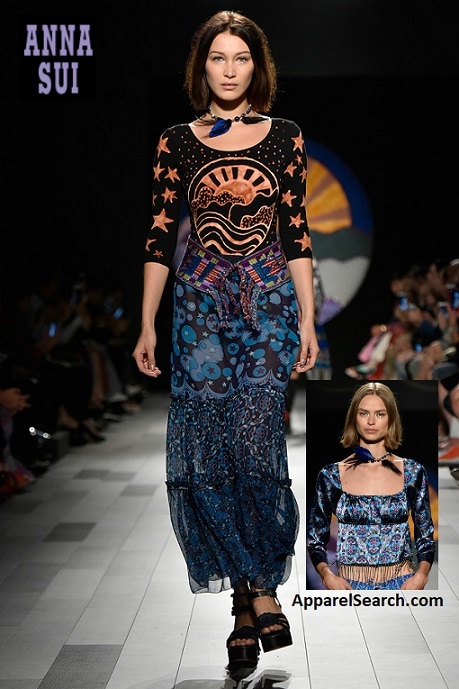 Learn more about the women's Anna Sui fashion brand at her website. If you have changed your mind and do not wish to research the brand Anna Sui, you can use the search engine on this page to find another clothing label that may be of more interest. Apparel Search is a leading guide to fashion, style, clothing, glam and all things relevant to apparel. We hope that you find this Anna Sui page to be helpful.